A friend told me about a special tradition she does with Christmas and winter holiday books. She wraps them up for her young children and starting on December 1st they open one book to read each evening as a sort of Advent Book Celebration. Since then I've seen many other people online partake in this tradition and I've always thought it was really cool. This year we decided to join in and try this out. I have collected a few holiday books over time from bookstores and thrift shops, but many also came from the local library. I love that anyone can do this idea, it is something that can end up costing zilch, (thanks to libraries or swapping with friends) and is totally adaptable to what you like. I'm usually partial to classic or heartwarming well-illustrated titles. 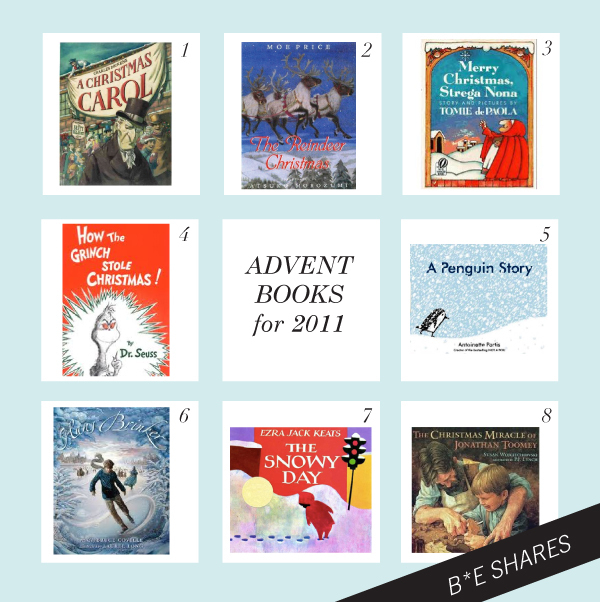 Here is part one of our Advent books for 2011. 1 A Christmas Carol - I enjoy the mysterious illustrations by Brett Helquist that pair well with Dickens' style. 2 The Reindeer Christmas - This story by Moe Price about how Santa decided to choose reindeers to pull his sleigh opposed to alligators or elephants is charming and superbly illustrated by Japanese artist Atsuko Morozumi. I got this title at the library but it is so gorgeous I'm putting it on our wish list. 3 Merry Christmas Strega Nona - I am a fan of Tomie DePaola 70's illustration style and this title is about surprise acts of kindness. 4 How the Grinch Stole Christmas - A classic! The movie is a hoot too, I love Dr. Suess. We will probably watch the cartoon edition movie this season too. 5 A Penguin Story - More of a winter selection, but I love penguins and this graphic illustration style by Antoinette Portis. It is also nice to throw some shorter titles in the mix for our little ones. I like that the main character is all about exploration and seeking out new adventures. 6 Hans Brinker - We used to watch this movie growing up around Christmas so I am excited to share this endearing story with our girls, really pretty art inside too. 7 The Snowy Day - Another classic, can you believe it has been around for 50 years?! A title geared to small ones, also award winning. 8 The Christmas Miracle of Jonathan Toomey - I went to this play a few years back and ever since then have loved the tender story about healing and love, the illustrations by P.J. Lynch are beautiful too. I have more selections to share coming your way, but would love to hear about your favorites! oh my gosh, what an amazing idea!! i love this idea! your recommendations are great--i just put all of them on hold at the library. as a teacher, i tend to get unusually excited about good children's books. i also love santa calls, by william joyce. the polar express is also a great one, although it always made me sort of sad. can't wait to see what else you have collected! In my previous life as a prep teacher (littlies in Australia) my kidletts always loved Olive the other reindeer. I can't wait for it to mean something to my little one. At 18 months he may be a little young, but maybe next year! I love "Winter Woes" - Clever and funny. Brittany -- cool I will check out Santa Calls I haven't heard of that one. Polar Express is great too, it is on my list. Thanks for sharing. Caroline - I just picked up Olive the other reindeer from the library to read over :) it may be on our list this year too. Thanks for sharing! Our youngest is 14 months and I'm sure next year will be better for her too. Thanks Kylie, I will check that one out too. Great picks! I can't wait to hear about your other ones. I recently came across The First Christmas Stocking by Elizabeth Winthrop--so beautiful and touching! I love the Grinch! I also have a couple of books by Carol Ann Duffy that are nice Christmas tales. Just shared this with my blog readers via Facebook! I discovered this one from my aunt a fellow children's book collector last year, I'll Be Home For Christmas (Toot & Puddle) by Holly Hobbie. It has beautiful illustrations and the story of two dear friends coming together for the holidays is heart warming. Thanks for your recommendations as I have added a few to my wish list and look forward to the rest! I'm so glad you're sharing your favorites, Rachel. I was just thinking the other day how badly we needed to freshen up our holiday book collection. These all sound wonderful! we're doing this too! my new favorite (as of yesterday when i picked it up) is the nativity by julie vivas. the text is from the bible, which i love...classic and beautiful and simple. but the illustrations are out of this world....so beautiful i almost cried. This is a brilliant idea. I absolutely love it! My favourite Christmas book is "A Christmas Mystery" by Jostein Gaardner. It's an advent story in itself..
How could I forget Corduroy! Love all these Christmas books! 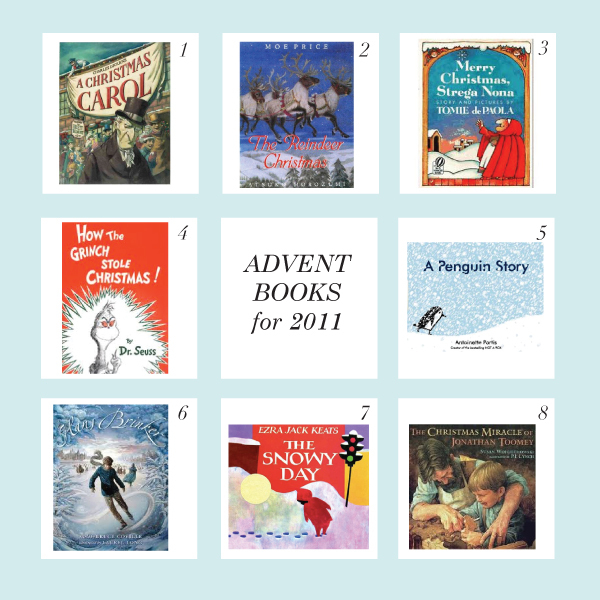 Great tie in for Advent - I loved doing chocolate Advent calendars when I was little.